Designed to grant you comfort and support each night, our Single memory foam pillow is ideal for making every night sleep as comfortable as you longed for. With Memory Foam fillings, this plump pillow gives outstanding support for those who sleep on their side. This memory foam pillow contours according the shape of your body and keeps your spine aligned. With removable cover, you can keep it clean and fresh for everyday use. 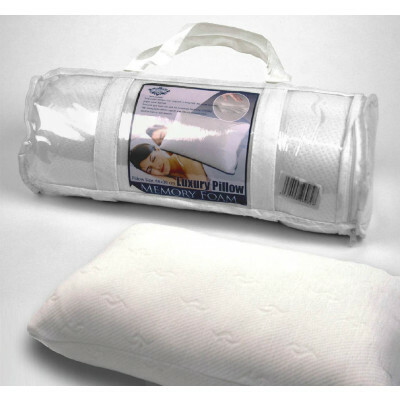 Available in 26" x 14" size, this pillow is anti-allergenic and resistant to dust mites. Sizes available: 26" x 14"
Our extensive ranges of memory foam pillows are perfect for giving you a blissful sleep. Our pillows are filled with luxurious memory foam that contours according to the shape of your body and thus uniformly distribute your weight on pillow. Our pillows will reduce excess pressure throughout the night that you experience with normal pillows. Apart from providing relief from various bodily aches, they reward you with remarkable support and better bodily posture. Cased with quality memory foam, our pillows are highly durable and machine washable. Our memory foam pillows has a removable cover and are available in various packs to suit your requirements instantly.